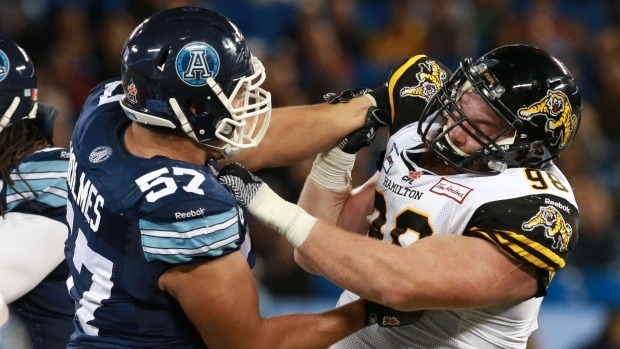 The Hamilton Tiger-Cats have reportedly lost two valuable Canadian depth players for the entire 2015 season. According to the Hamilton Spectator's Drew Edwards, lineman Linden Gaydosh and wide receiver Spencer Watt suffered Achilles injuries this week during training. Gaydosh signed with the Ticats on Sept. 4, more than a year after they took the University of Calgary star No. 1 in the 2013 CFL draft. He appeared in nine regular-season games, registering four tackles, two tackles for a loss and a pass knockdown. He added four tackles in two playoff contests. Watt was drafted in the third round, 18th overall, by the Toronto Argonauts in 2010 where he won the 2012 Grey Cup. He signed to a two-year contract extension with the Argos 2013 before joining the Tiger-Cats as a free agent this past February.